Currently in our 4th week of fieldwork, we unfortunately had to say already good-bye to two of our team members who travelled back to Khartoum today: Kenneth Griffin, a Lecturer in Egyptology at Swansea University, was here as an external expert. As last year, Ken was, together with Meg Gundlach, registering all of our objects – quite a task with the numerous finds from SAV1 East and SAV1 West (apologies that there were yet no new seals Ken loves so much – hopefully we’ll find some in the next weeks :-)). Being very grateful to Ken who did a great job as always, I would also like to express my thanks to Swansea University and all the colleagues who enabled him to join AcrossBorders again – much appreciated! The second person who left us today after a productive stay was a newcomer to the project: Roa Abdelazim joined us as a trainee from NCAM – coming for the first time in her life to Sai Island! 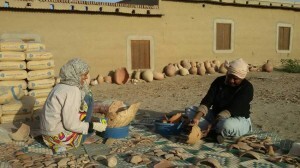 Our two happy NCAM pottery ladies: our inspector Huda helping Roa with all the pottery fragments. Being interested and specialised in conservation, Roa spent 2 of her 3 weeks on Sai working on the pottery from tomb 26. With amazing results! 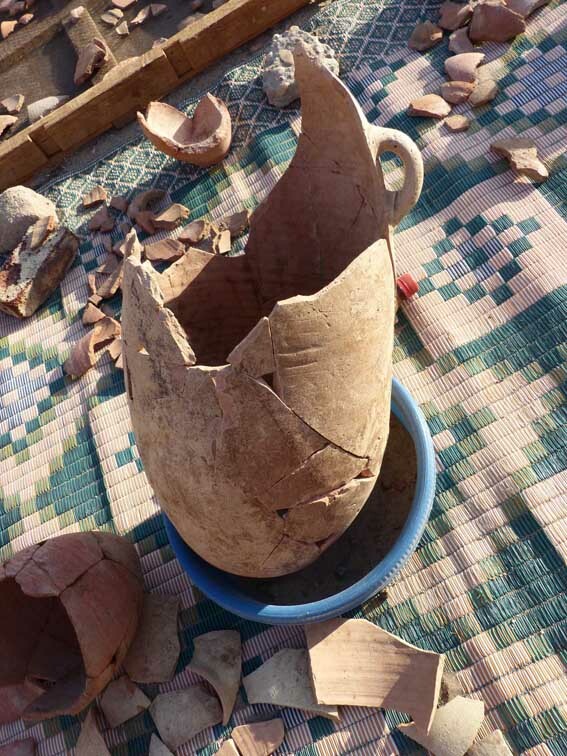 The sherds from the lowest shaft filling and the uppermost layers of the chamber nicely match and she was able to reconstruct 8 almost complete vessels, among it a very nice Marl clay amphora. I am confident that we will find more matching pieces during the next weeks. One of the vessels Roa was able to reconstruct out of small fragments! I am very thankful to Roa and I hope she enjoyed her stay – despite the nimiti and our very limited skills in Arabic conversation – as much as we were happy to have her here! Hope to welcome both, Ken and Roa, soon again – next season insha’allah! uuuupps: sorry Ken, but the first clay sealing just turned up today at SAV1 East!!! Very exciting context – next to new section of 18th Dynasty wall in extension to Square 4B; 76% of the pottery is dating to the mid-18th Dynasty… promising! We’ll keep you updated! Thanks again!